From time to time, HCI invites guest commentary from our community. The views reflected in these commentaries are those of the author and do not necessarily represent the official views of HCI. 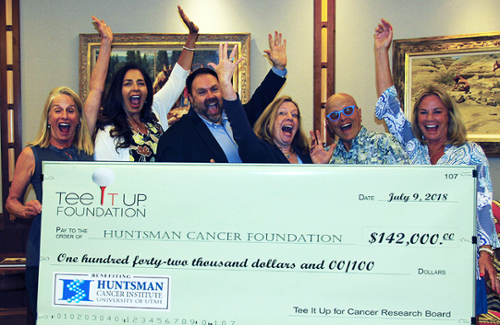 Tee It Up Foundation co-founder Marianne Goldthorpe and board member Lidia Di Lello talk about their organization’s philanthropic efforts to raise money for cancer research at Huntsman Cancer Institute (HCI). Marianne and Lidia represent two of the five determined women who are motived to help change outcomes from hope to cures through their golf and auction events. What sparked the creation of the Tee It Up Foundation? Marianne: Women in Park City, Utah, including myself, were fundraising for national cancer charities for years. In 2012, we decided to fundraise for a local organization—an organization our community would rally behind. Nothing was more fitting than HCI because of their passion for research, education, and patient care. Within the first year, we raised $36,000 for cancer research at HCI. But my co-founder, Jane Peterson, and I thought more could be done. That is when we created a board of five determined women who formed the Tee It Up Foundation, a nonprofit solely dedicated to making a difference in our community by fundraising for cancer research at HCI. Where does your passion for cancer research come from? Marianne: My passion was driven by my personal cancer experience in 1999, when I volunteered for a phase II clinical trial. I am alive today because of science and the [clinical] trial. I am a big supporter of clinical trials. The breakthroughs in cancer research make it so less is required of cancer care teams in terms of treatment, and in turn we as women and people are able to survive longer. Lidia: While most of the women on our board, excluding Marianne, may not have personal cancer stories, the longer we work together, the more people we hear about in our larger social circles that are being affected by this terrible disease. For example, I emailed a friend and colleague I had not spoken to in a few months. Within a few minutes I received a bounceback email informing me that my friend had passed away. The reality is cancer affects everyone. What was the inspiration behind the women’s-only board and event? Lidia: The collaboration of likeminded women who share a passion for a cause creates such a powerful sense of community. The Tee It Up Foundation is more than a fundraising mechanism for cancer research at HCI—it is an opportunity to learn from one another’s experiences. Our community events remind us, as women, that this fight against cancer is a community fight. And our golf event is just one platform for waking women up and getting them to participate financially, emotionally, and be part of the solution of eradicating this disease from the face of the earth. Marianne: I fundraise for HCI on behalf of the Tee It Up Foundation because I have personally seen the impact research has on an individual’s life, including my own. Lidia: The reason I fundraise for HCI on behalf of the Tee It Up Foundation is because donations from one community—or even one person—have a bigger impact through Huntsman Cancer Foundation. A dollar to the Huntsman Cancer Foundation is not a single dollar, but one added to many. And the impact of that dollar becomes extensive. What keeps the members of the Tee It Up Foundation inspired to keep fundraising? Marianne: We are proud of the work we have done to create a new mission statement for our Foundation, which is, “Changing the outcome from hope to cure.” The five women of our board sat down and the mission came out with ease. Every one of us feels strongly about every word of that mission—it is what keeps us inspired to continue to fundraise. We are five determined women, but we are five different women, with a community behind us, who are determined to continue to help fight this terrible disease. In 2018, the women of the Tee It Up Foundation donated $142,000 to cancer research at HCI, bringing their total contributions to HCI to more than $750,000 in the past seven years. The annual Whoop It Up Party and Auction for Cancer Research will be held Friday June, 21, 2019. Visit the Tee It Up Foundation website to learn more.